According to the CDC, over half of Americans are missing at least one tooth. The most common causes for losing teeth are cavities, gum disease, and trauma to the mouth. Missing teeth can lead to diminished function, poor esthetics, and can lead to further damage to remaining teeth. There are many options to replace a single tooth or many missing teeth. Dr. Fraiz and Dr. Beavers have tremendous experience in restoring oral health and function for patients who are missing teeth. Call us to set up an appointment if you are missing a tooth or many teeth and are interested in having them replaced. Whether you are missing a single tooth or multiple teeth, dental implants are a great way to replace your missing teeth. Dental implants replace both the root and crown structures of a tooth to afford you a natural-looking and functional tooth. 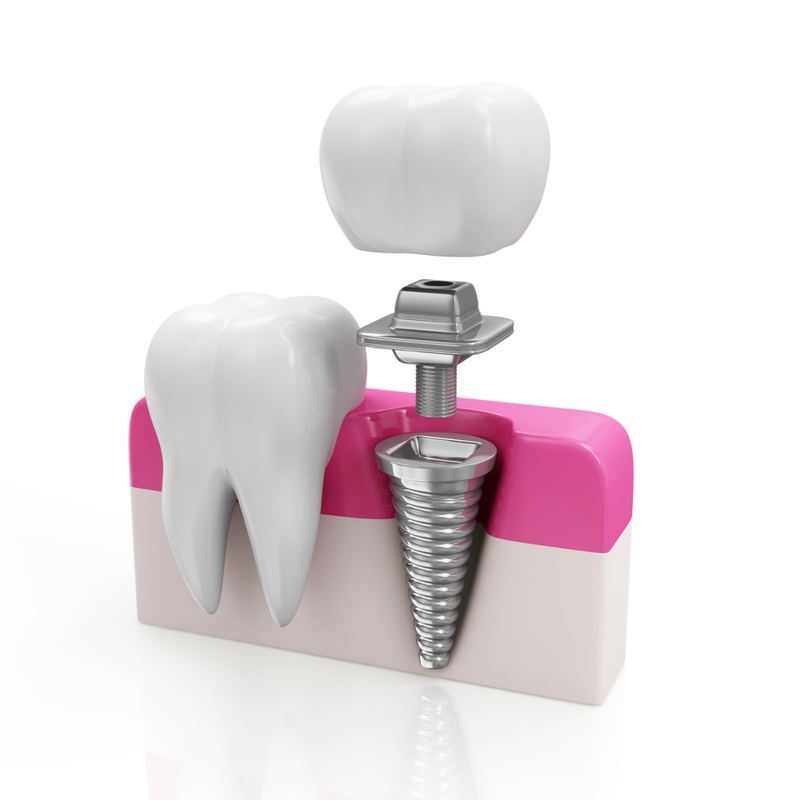 Many people who have implants even forget which tooth is the implant. Implants can also be used to secure a denture. If your denture falls out or you feel like you can't eat the foods you want to eat, dental implants may be a good solution for you. When receiving placing implants, the area where the implant is to be placed will be numbed to make the patient feel comfortable. A small incision is made in the gums and a small pilot hole is drilled to make space for the implant body. Depending on the patient, the gums may be closed over the dental implant body to heal for 3-4 months. In other cases, a temporary crown may be placed immediately on the dental implant body. After the dental implant body has been accepted by the patient's body, a digital scan of the patients mouth is taken to fabricate the permanent crown. Once the permanent crown has been placed on top of the dental implant body, the implant is ready for use! 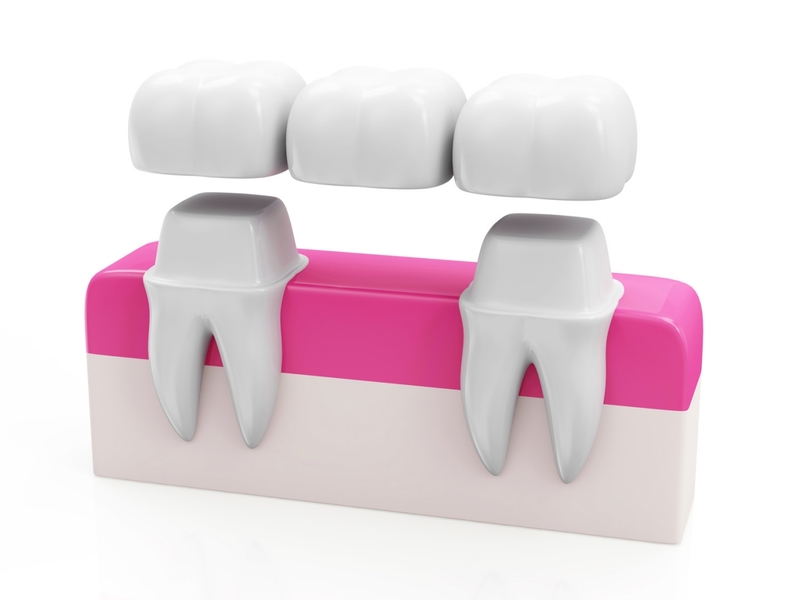 If you are missing teeth, a dental bridge may be a very beneficial treatment option for you. Dental bridges are often placed when one or tooth teeth are missing, causing a gap in a patient's smile. A bridge is essentially two tooth-colored crowns with one or two fake teeth attached between them, depending on how many teeth are being replaced. A bridge is a very esthetic, natural-looking restoration that can restore a patient's confidence in their smile. When preparing a patient's teeth for a bridge, our doctors will numb the area of the mouth to make the patient feel comfortable. The teeth adjacent to the area missing teeth are then shaved down. We take a digital scan of the teeth and the rest of the mouth to get an exact color match and to ensure that the new bridge will fit perfectly. The patient will receive a temporary bridge for 2-3 weeks while the digital scan is sent to the dental laboratory and the ceramic bridge is fabricated. When the bridge is ready, the patient will come back for bridge delivery. The new tooth-colored bridge is then ready for chewing immediately after the appointment. When several teeth are missing, a removable partial denture may be an appropriate treatment option. A removable partial denture (RPD) has a flexible, pink acrylic base that contains the false teeth to replace the patient's missing teeth. An RPD uses clasps to hold on to the patient's adjacent natural teeth to ensure a snug fit. When a patient comes in for an RPD, our doctors will examine their gums, teeth, and overall oral health. A digital scan is taken of the patient's mouth to 3D print an exact replica of their teeth and gums. This model used then used to fabricate the flexible RPD. The patient will then come back 2-3 weeks later for delivery of their prosthesis. An RPD is suitable for chewing, but it should be taken out at and cleaned at night while the patient sleeps to prevent bacterial and fungal infection. If you are missing multiple or all of your teeth, a complete denture may be an appropriate treatment for you. A complete denture is also known as a "plate" or "false teeth". When you are missing your natural teeth, complete dentures allow you to chew your food easier and to speak more clearly. In addition, they can be matched to your natural smile for a more attractive and youthful appearance. 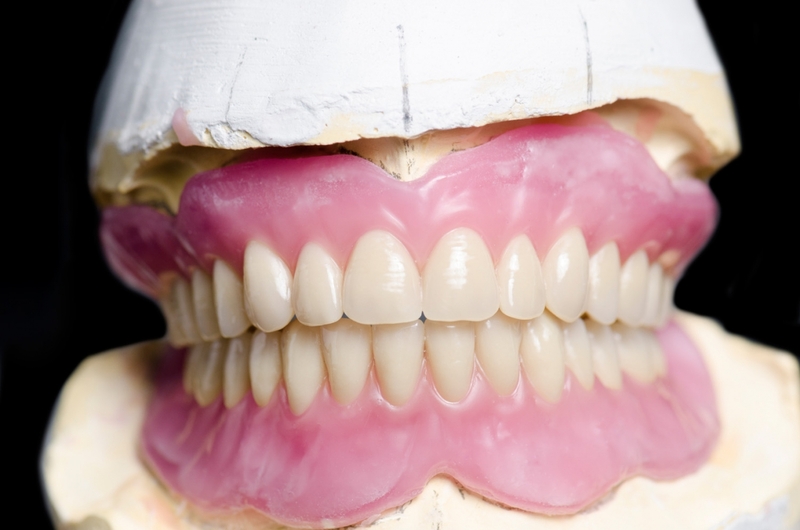 The process of making a full denture varies with each patient, but it usually involves a series of appointments. Through these appointments there are various impressions and trial periods where we take measurements of the patient's bite and relation of their jaws. Once the final denture is fabricated, it is delivered. The patient may need to have the denture adjusted in areas after the delivery to relieve some sore spots. Receiving a new denture is similar to buying new shoes. It may take a while to break them in and get used to them, but many patients adapt very well to their new prosthesis and thoroughly enjoy their new smile. 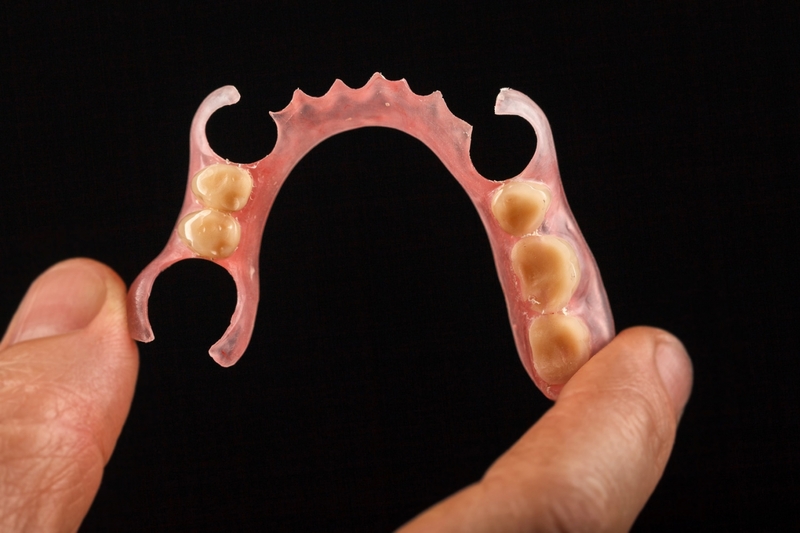 A temporary removable partial denture (flipper) is used when a patient needs to temporarily fill a gap in their smile while a more permanent solution is realized. A flipper is often used when a patient is healing after implant placement or after a patient has had a tooth extracted. The flipper is fabricated using models of the patient's mouth. 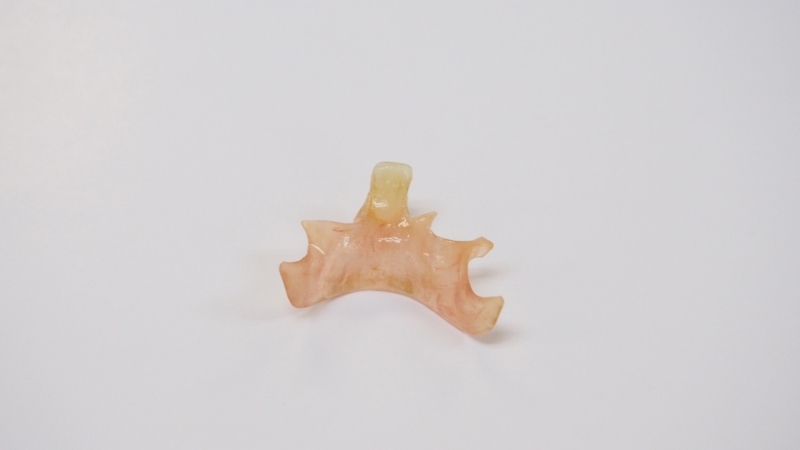 A pink acrylic base is used to match the patient's gums and a denture tooth is used to fill the desired space. A flipper is not strong enough to be chewed on and is only for esthetic purposes. The flipper must be taken out at night to be cleaned to avoid bacterial and/or fungal infection.